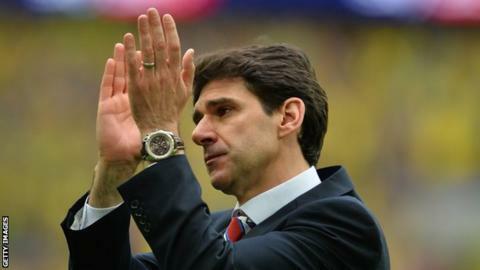 Middlesbrough manager Aitor Karanka was happy with the attitude displayed by his team in their Capital One Cup win. A Boro side with eight changes from Sunday's draw at Preston won 3-1 at League One Oldham. Karanka told BBC Tees: "The cup is difficult especially with a lower team and we went to the pitch today really really concentrated. "The attitude we showed today was completely different especially with the first-half on Sunday." "When we play with our attitude and style we can beat everyone, today we played against Oldham and on Saturday we will play against Bolton." Karanka said making so many changes was challenging for the team he fielded at Oldham. "They had to gel because I didn't like the game on Sunday, today we had a penalty and another chance from Christian Stuani and then lost a bit of control of the game but we recovered as soon as possible with Yani's goal," he said. Stuani scored two goals on his debut for the club but Karanka is not putting too much pressure on the striker. "The main thing is for his confidence because strikers need confidence and now he needs to be confident, I can't expect that Christian is going to be scoring two goals every single game." Middlesbrough play their next league game on Saturday at home to Bolton.